Project Sim Racer - Episode 8 - Sim Camp Day 1 - Who Needs Pedals? Project Sim Racer - Episode 9 - Sim Camp Day 2 - I guess I do need pedals. 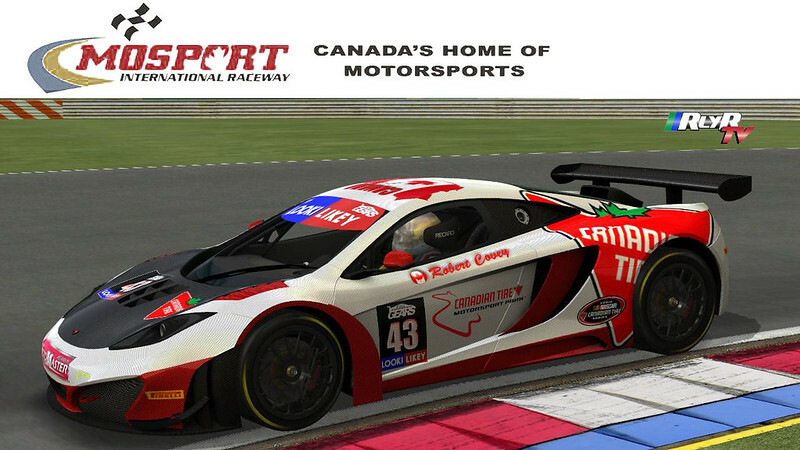 RylR League GEARS Series in my lovely McLaren MP4-12C GT3 (Below). If your interested in seeing some of the action that occurs in these 2hr stints feel free to have a look at one of our previous event videos. It has become one of my favourite tracks not just in terms of fun but in terms of pace as well! I'm very jealous that you live so close to it. Have you driven the track in real life yet? Ohhhh absolutely. I've never driven that track in anything close to a race car but did do some runs on it years ago in my street car and had an absolute blast. These days I'm never anything more then a spectator of events but maybe some day I'll do it again. I've never driven the iRacing version of this track but have run the Race 07 version as mentioned for GEARS (Has the bump at the apex coming out of Moss) and the AC version. It is a real shame that we don't have more tracks and higher number of motorsport enthusiasts here in Canada.